The office will remain closed for the rest of the day due to the snow. Jeanette, Cliff and Myself popped in this morning to check everything and it is all fine. The lane is heavily covered in snow and very difficult to drive down. Please do not attempt to get to Thornham today - stay safe & enjoy the snow! Berthing At Thornham Marina In Chichester Harbour! If you are looking for a special place to berth your boat this year call 01243 375 335 NOW! BRAND NEW FULLY SERVICED PONTOON BERTHS AVAILABLE! What do you look for when considering a berth for your much loved boat? A good old social party to meet like minded individuals. Thornham Marina has 81 BRAND NEW fully serviced pontoon berths and luxurious new toilet/shower facilities and we have a berth waiting for you! To find a berth that can tick all of your boxes - call Jeanette or Courtney on 01243 375 335 or email info@thornhammarina.com. To secure your berth at this year prices, pay a £200 deposit by the 31st Jan 2013! We can tick your boxes and float your boat! Let Jeanette's Little Helpers Clean Your Bottom! WOWEEE! YOU DON'T WANT TO LOOK LIKE THIS NEXT YEAR! Let us clean your bottom with our fantastic antifoul offer! Book now - pay nothing until March (apart from a £20 deposit by 31st Jan 2013 to secure a 10% discount)! Call Jeanette or Courtney now on 01243 375 335, with the type of antifoul you would like and colour (types and colour listed below) to receive your free quote. You can then sit back and relax until March. 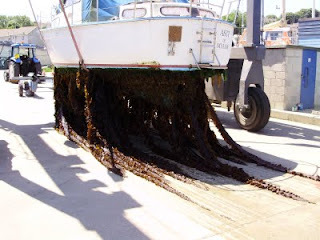 Seajet 033 Shogun - This is a self polishing antifoul, suited for boats on deep water moorings. Colours Available: Shark Grey, Mid Blue, Navy Blue, Red and Black. Seajet 037 Coastal - Ideal for drying moorings. Colours Available: Mid Blue, Navy Blue, Red and Black. Make sure you don’t miss out on this fantastic offer! Call or Email myself or Courtney now on 01243 375 335 / info@thornhammarina.com! If you don’t want to be left holding the roller this year, call now 01243 375 335 - the helpers are waiting to hear from you!